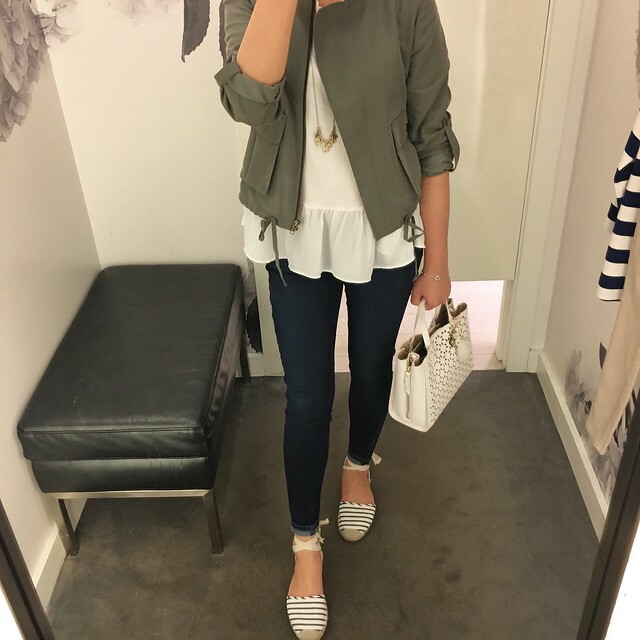 This bomber style jacket is one of my go-to throw on jackets since the olive color matches a lot so I was excited to see that a very similar style is back in chambray, a tan khaki color and black this season. I’m interested in trying the chambray color which has two positive reviews so far. I got this jacket in 2016 when it was a splurge for $88 and now the price is $99 in 2018. The jacket is not worth full-price considering the thin fabric they used but when I factor how much I ended up reaching for it I don’t regret buying it. I’ve machine washed my jacket and air dried it many times so the ease of care is a plus. There’s a similar light pink ruffle collar bomber jacket from LOFT that I want but I missed out on it in my size. I bookmarked the jacket and I keep stalking it from time to time. I recently saw it in person on Becky this past weekend and now I just have to have it. Will you be shopping the Nordstrom Anniversay Sale? I created a dedicated page on my blog here since I’m not sure if I can do the sale as much justice compared to other bloggers that clearly live and die by the infamous #nsale. Early access starts tomorrow July 12th (well in less than 3 hours by the time I publish this post), access to the general public begins July 20th and the sale ends on August 5th this year. I typically ignore the infamous #nsale unless I spot something really cute. Personally I haven’t had a lot of luck shopping at Nordstrom which explains why you rarely see me covering Nordstrom finds or their sales unlike other shopping blogs. 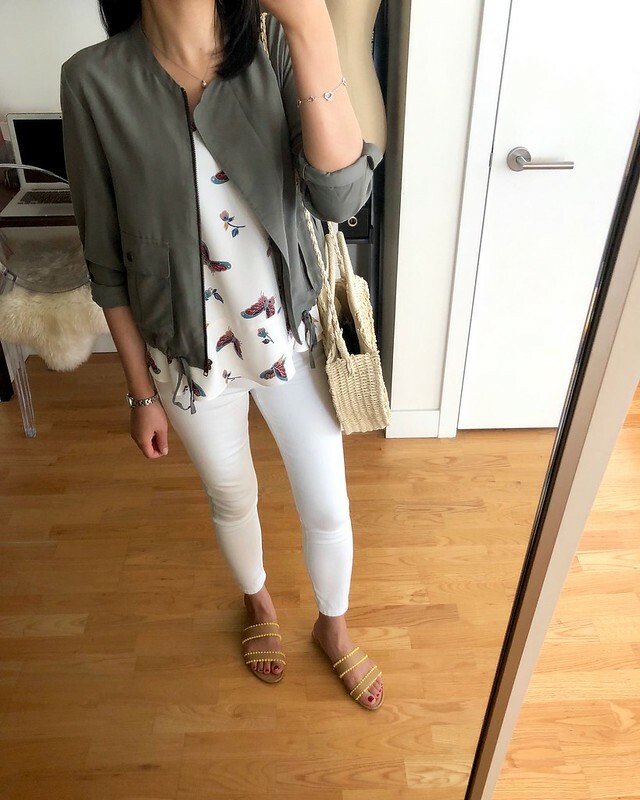 This year I placed 5 orders and being the return queen that I am, the only item I managed to keep are these Topshop Jamie high waist ankle skinny Jeans (review and measurements here). I am contemplating this dark blue pair from the sale and I’ll try going up from my usual size like I did with the pair I have in white. 1. 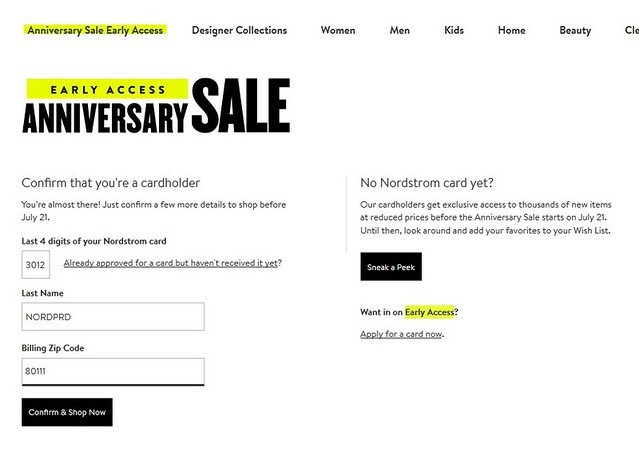 You don’t need to sign up for a credit card to shop Early Access – If you don’t have a Nordstrom card check out the below tip for how to gain access to shop the #nsale without being a credit card holder. Hopefully this tip still works this year (update: thanks to those who confirmed in the comments that this tip worked for you!). I have a Nordstrom Rewards card to earn rewards points only (not the credit card) and I was able to order online with this workaround. However, you should be able to shop using this workaround without signing up for the credit card or rewards card. 2. Don’t sweat it – Per Annie‘s helpful tip from 2017, Nordstrom will honor the sale price of an item that has been restocked only if your #nsale order was cancelled. Therefore, I wouldn’t sweat it if you miss out on an item due to a cancelled order as long as you don’t mind online stalking an item. I bookmark the item’s page and check at random times throughout the day for pop-ups in the size/color I want. After all, fall weather is still far out and I wouldn’t want to spend 3 weeks of summer shopping solely based on a fear of missing out. In 2017 the only purchase I made were for the popular Vince Camuto Fileana Split Shaft Bootie (review here) in September well after the #nsale had ended. I had tried to order the booties during the sale only to have my orders cancelled twice so they price matched the sale price when I did finally manage to order them in September. In full disclosure, I ended up returning them since the style didn’t fit my feet comfortably so technically I didn’t keep anything from the 2017 sale. Topshop Lily Knit Back Midi Coat ($82.90) – Kendall reviewed this chic menswear inspired camel coat in her Instagram stories. Update 7/16: I caved and ordered this coat in size 2 (supposedly fits like size 0). I’ve been wanting a camel coat and I’m hopeful that it will fit me well since the J.Crew Factory wool topcoat did not work out for me (review here). The coat is currently backordered with an estimated ship date of 7/20 so it will be some time before I receive it. Update 8/5: Nordstrom cancelled my order for this coat much to my disappopintment. 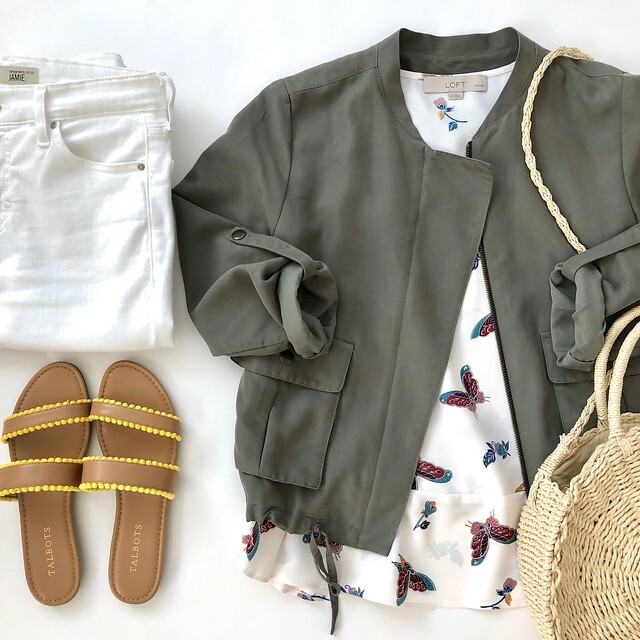 Caslon Draped Utility Jacket (sale price: $45.90) – This popular jacket is back and you can catch my review here. The draped collar can be very overwhelming if you have a smaller chest. I ended up returning the size I reviewed in 2016 since I never reached for the jacket due to the larger lapels. You can check out my other past season #nsale reviews below. I’d love to know if you have any recommendations or if there’s anything you’d like me to review. Perhaps you’re avoiding the sale because summer is too short and #yolo and all that. As an aside, I noticed Daniel Levy as one of the faces gracing the pre-sale banners and my husband and I just finished binge watching all 3 seasons of Schitt’s Creek tonight. P.S. I just received the latest LOFT mailer and the next everything sale is July 18-22, 2018. It will be 40% off for non-cardmembers and 50% off for cardmembers. Love your honest post. Especially since a lot of other bloggers make you feel like you have to have the Nordstrom credit card in order to roll with the cool kids and shop early. But I agree, I’m not seeing anything majorly exciting and haven’t in the past either. LOFT has way cuter styles all the times for my personal taste. Thanks for all the amazing tips on LOFT sales and even the NS early access (if one might find something and not just buy under pressure). Thanks Gritt! My pleasure! I don't need another credit card because that puts you at risk of possibly forgetting to pay yet another bill. 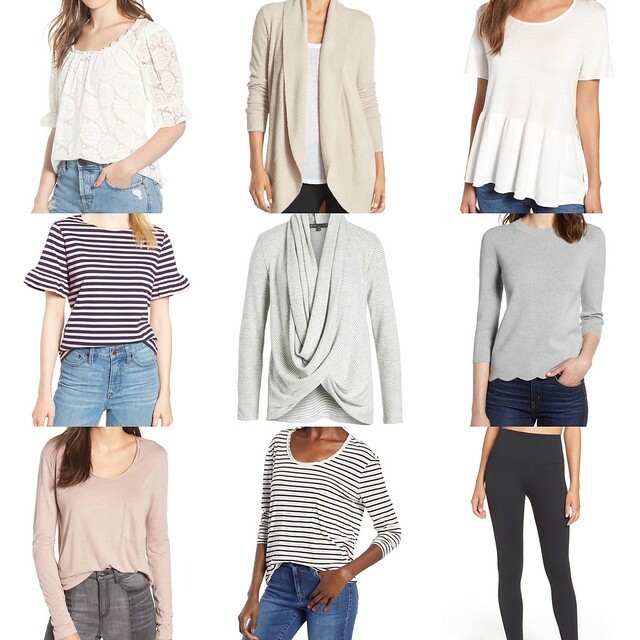 I ordered some basics this morning out of sheer curiosity. 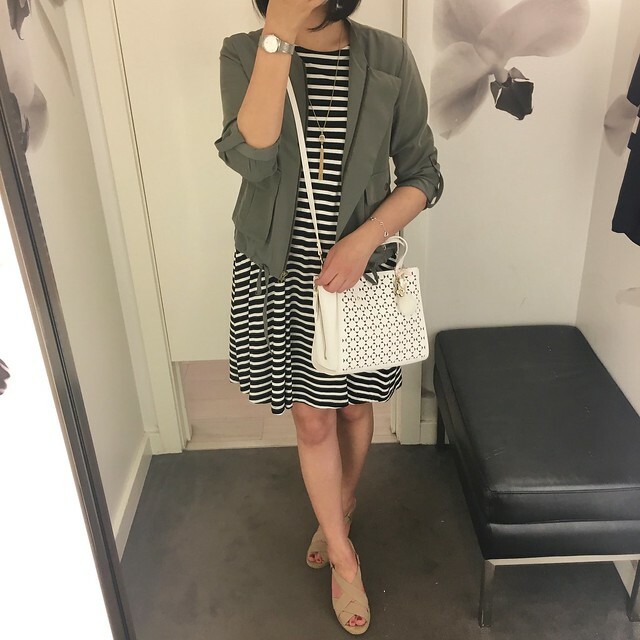 As much as I try to branch out, I find LOFT (and Ann Taylor) cut and styles suit my body best. They're getting a lot better at releasing cute new arrivals to keep us coming back too! Thanks for the workaround, it worked for me–I love the Caslon blazers from Nordstroms. By the way, I do most of my shopping at Loft and love your reviews. Thanks for confirming that the workaround worked for you too! I need to try the Caslon blazers some time. I appreciate your shared love for LOFT and my reviews! I'll try to post a new one soon but I was hoping they'd have a better sale sooner before I did. You're welcome! Thank you for confirming! You're welcome! Thank you so much for your continued support here and on Instagram! Hi! I updated my instructions above after your comment. When browsing an Early Access product you'll see the option to 'Confirm Card to Add to Bag' right below it. Enter the avalues I shared at the top of this post and then click on the 'Confirm & Shop Now' button to shop the sale! Can I ask how you found the workaround? Is someone getting credit or points for our purchases? I mean, I’m probably going to use it, but im just wondering how you figured this out. It’s genius! It was an insider tip I read online about 2 years ago and supposedly the source of this helpful tip was an employee. Hi Kristin, I created a new Nordstrom account with one of my other emails to test it and it still works. I did notice that it made me login again even though I swear I was already logged in and then I saw a very similar form as the one in my above screenshot. Ohh… well I apologize for not testing it fully! I thought I was doomed when it forced me to login (cuz then it'd know I don't have a N-card tied to that account). But I just logged in with my regular info and I do see the fields! I'll try to order now. THANK YOU!!! No worries and you're welcome! Persistence always pays off!